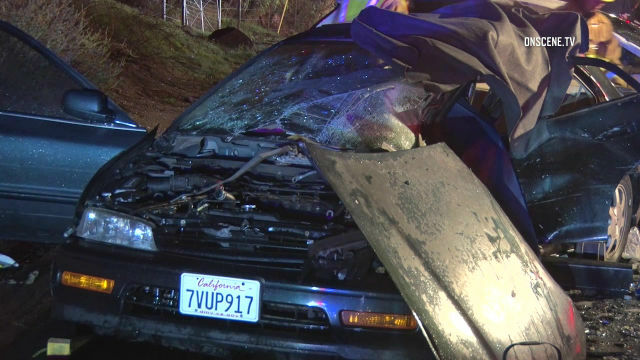 Authorities Monday released the names of two Escondido men killed when the stolen car they were in crashed head-on into another vehicle during an early-morning law enforcement pursuit in Valley Center. Mario Alberto Lemus Garcia and Gabriel Gomez Gutierrez, both 22, died at the scene of the March 18 wreck on Valley Center Road, according to the San Diego County Medical Examiner’s Office. The chase began just before 1 a.m., when patrol deputies spotted a Honda Accord that had been reported stolen in Escondido and tried to pull it over, sheriff’s Sgt. Michael Tingley said. The driver, Gutierrez, allegedly refused to yield and fled at high speed. The deputies tailed him for a time, then backed off for safety reasons and let a sheriff’s helicopter crew track the suspects’ path of travel from above. A short time later, the northbound Honda veered into a southbound lane near Rocky Top Lane and collided with an oncoming compact car, Tingley said. Garcia and Gutierrez died at the scene of the crash. Another person who had been riding in the Accord was taken to a hospital, along with someone who had been in the second vehicle. Their conditions were not released.